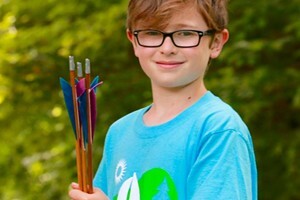 Stage Flight: A Seventh Grader Soars in the Theater | One to Watch | Kids VT - small people, big ideas! 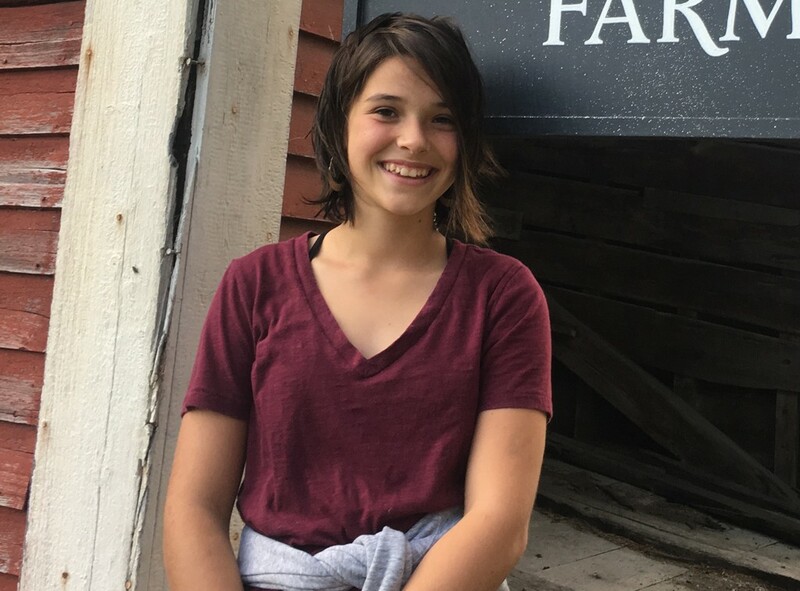 Of all the roles Maeve Miller has played in her life — farm hand, actor, babysitter, musician, soccer player — one is her favorite. "I love being on stage," the Strafford 12-year-old said. She started acting lessons at age 5 and landed roles in children's community theater. Now she sings and acts in school productions at the Newton School, where she's in seventh grade. "I like the feeling of butterflies in my stomach," she said. Most people don't, this reporter pointed out, because it means they're nervous. "It does," she said. "But it's also a new opportunity because if you mess up, there's a lot of improvising you'll need to do, and it's just fun to improvise and make stuff up as you go, too." Two directors who have worked with Maeve described her as someone who shines. Renowned classical pianist Annemieke McLane directs the United Church of Strafford youth choir, of which Maeve is a member. "She shines on stage; that's how it is," McLane said. Nearly 5,000 people will see for themselves when Maeve stars in The Christmas Revels: A Nordic Celebration of the Winter Solstice at Hopkins Center for the Arts in Hanover, N.H., next month. The show, a 43-year-old Upper Valley tradition, is one of 10 Revels Christmas shows staged across the country. Cowritten by Revels North artistic director Nils Fredland, the story follows a young girl who goes in search of her Nordic heritage. It will feature six guest professional performers, seven specialty dancers, and 73 local singers, dancers and actors ages 7 to 70-something. The six performances are expected to sell out. Maeve's character, "the girl," will be on stage for 80 percent of the show. "It's a lot to put on the shoulders of a young person," Fredland acknowledged. "And so, during the auditions, I was really looking for someone that exuded both flexibility and confidence, that took direction well, you know? And Maeve really shined." Everyone who tried out for the show participated in the choral audition. Maeve chose to go through optional acting and dance auditions as well. "I threw a style of dance at her that I am absolutely certain she had never done before," Fredland said. "And just watching her engage in the process of 20 minutes, starting at ground zero and moving to, 'Oh, yeah, I think I can get this in my body' — it really was a great thing to witness." Maeve won the lead — "No, way!" she said when her mom told her — and her life became its own tightly choreographed dance when rehearsals started in September. For now, they are on Mondays and Thursdays. She boards the school bus at 7:15 a.m. on Monday, attends school until 3 p.m., goes to soccer practice from 3 to 5 p.m., takes a 30-minute drive to Norwich for Revels dance rehearsal, then another short drive to Hanover for chorus rehearsal. She gets home around 10 p.m. Thursday's schedule gets her home by 9 p.m.
"I'm going to get all of the [school] work that I can get done in the car on the ride to Revels and after, on the ride home," Maeve said. She plans to tackle her online algebra class homework on the weekends. She also helps out at Strafford Village Farm, founded by her parents, BJ Miller and Shannon Varley. They work full-time jobs off of the farm, so Maeve and her 10-year-old brother, Luke, help feed and water pigs, cattle and sheep. During the spring lambing season, Maeve spent hours in the barn with the ewes. "If you stay there long enough, and you stay still enough," she said, "you can see them give birth, and that's pretty cool." Maeve has her feet planted on the farm, her eyes on the stage and a solid backup plan. "I want to be an actress," she said. "But if that doesn't work out, I want to be a teacher." The Christmas Revels: A Nordic Celebration of the Winter Solstice takes place Thursday through Sunday, December 14-17, in Spaulding Auditorium at the Hopkins Center for the Arts. To purchase tickets, visit hop.dartmouth.edu/Online/christmas-revels-2017.